• Material: high quality aluminum alloy and CNC machined. 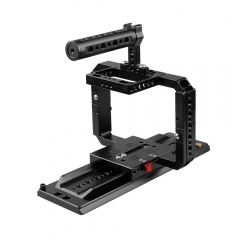 • Plenty of 1/4"-20 and 3/8"-16 threaded holes throughout the cage shoulder rig for more mounting possibilities. 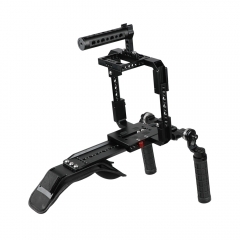 it's very solid and durable due to its aluminum alloy construction. 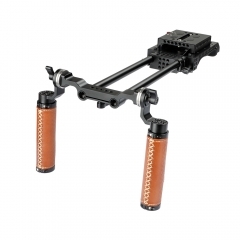 • This professional cage rig can be used as handheld, shoulder mount or on tripod, in any ways it delivers balanced shots with immense convenience and comfort for long hours of shooting. 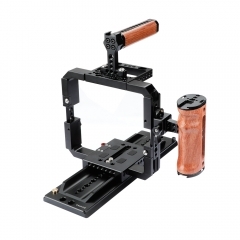 • Specially designed for RED DSMC2 cameras, which can efficiently avoid and eliminate any microseism or any blur of pictures caused by movement of shake while in shooting, to make your shooting much more stable and clear and professional. 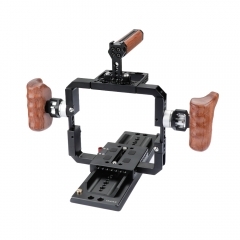 CAMVATE Quick Release Cage Rig With Wooden Gr..
CAMVATE Solid Cage Rig With Wooden Grips & 12..
CAMVATE Full Frame Cage Rig With ARRI Sliding..